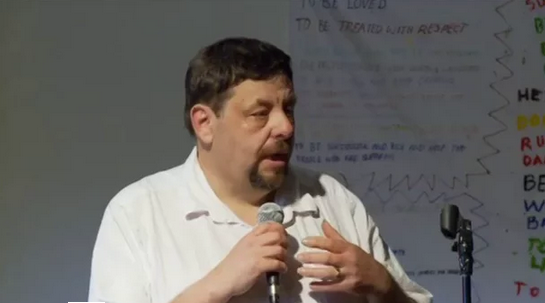 In March 2013, Ron Coleman, one of the leading figures of the Hearing Voices Movement, offered a keynote at Dulwich Centre’s 11th International Narrative Therapy and Community Work which inspired participants. We’re delighted to include five clips from his presentation here. Ron begins with a lament that there was never a chance for Marrius Romme (founder of the Hearing Voices Movement) and Michael White to meet in person. He then offers a short history of the Hearing Voices Movement. Within this history, he honours the contributions of Mickey de Valda, Jon Williams and Terence McLaughlin, all of whom have passed away. Here Ron challenges and inspires workers in the mental health system to reclaim our professions. Ron describes the key steps in his own healing and provides learnings for others in the process. Drawing on lessons from other social movements, Ron invites us to play our part in transforming understandings and practices in relation to mental health. As a proud Scottish Celt, Ron dares to look beyond the colonisation of madness and invites us to do the same. At the end of this presentation, Taimalie Kiwi Tamasese offers a reflection. Absolutely stunning! Thank you Ron for your insightful, funny, descriptive, absolutely real reflections. I especially loved the DSM parties…and the midwifery of the soul. What you have said has helped me put a whole lot of personal and professional experiences in health into another perspective and inspired me to believe I can make a difference. Thank you very much for sharing your thoughts and experience. Thanks the Dulwich centre for sharing your videos, seems a good team, people and fridays afternoon. I work with the state in the mental field, with battered woman, almost no experiences with hearing voices… It inspired me what you say about being a MIDWIFE OF THE SOUL, and all you talk about power. In my place of work burocracy, with good intentions, i want to believe, fills us with “methods one size fits all”, most of them from other countries (i am from the north of Mexico). I have been able to skip them most of the time, and sometimes i loose hope. I still can do my work and i am learning about narrative therapy and i can use it there, that keeps me going. You give me hope when you say we can do something, we can take power, when you invite us to believe in change. Sometimes the burden of the kind of work in the institutions tired me, but you lift again my hope. Sometimes i have been called a “revelde” not know english word, for criticizing the system or those “one size fits all” “treatments . I have just had a chance to watch 2 of your 5 videos. I will watch the others soon. But in the meantime I just wanted to write to say how much i appreciated hearing about the history of the ‘hearing voices network’, your passion, knowledge, and challenge to recover our professions. I first became aware of the network about 10 years ago and remember my excitement about a different way of looking at what I always heard named ‘schizophrenia’ and how much it helped in my work alongside persons hearing voices …and i continue to share the papers from the 2003 ‘Mental Health’ issue of the IJNTCW. What an important and powerful learning from Marius “Hearing voices is a normal human experience” Just this week I had conversations with two people tormented, ridiculed and intimidated by negative voices. With one I’ve experienced the privilege to walk alongside as he is the one delivering the outcome. The other, I knew i was faltering, stumbling – aware to not challenge her reality, and yet also not knowing at times how to proceed. I think had i watched your videos before…I would have been thinking more about your challenge of my job as ‘midwife of the soul’. I also am curious to learn more about voice healing/healers. Thank you so very much for sharing your lived experience, knowledge and passion. It made me with I had been at your keynote at the international conference in Adelaide. Having these videos will be immensely helpful to many.